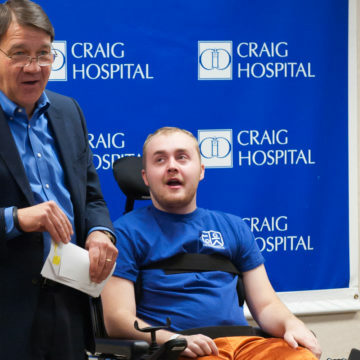 Cameren Nelson, a Craig Hospital patient, was presented with a new power wheelchair at an event at Craig on Nov. 19. The chair was donated by the Darrell Gwynn Foundation. Nelson is the 14th Craig patient or graduate to receive a wheelchair through the Foundation. Nelson, a 20-year-old resident of Hankinson, N.D., was paralyzed in a diving accident on Aug.16. Nelson dove off a dock in a local lake and hit a sandbar, breaking his C5 and C6 vertebrae. After surgery and two weeks at a hospital in Fargo, he was transferred to Craig Hospital in Englewood, Colo. for rehabilitation. Nelson has regained some movement on the left side of his body and hopes that he will continue to see improvement over the next year. Nelson will discharge from Craig on Nov. 20 and will return home to live at his parent’s house in Hankinson. He plans to spend the next year focusing on outpatient therapy and hopes to eventually return to college at North Dakota State College of Science to study machining or physical therapy. In 1990, Darrell Gwynn was at the height of his career as a professional race car driver. Then, on a test run in England, an accident left him paralyzed with a spinal cord injury. Together with his wife Lisa, he founded the Darrell Gwynn Foundation in 2002 to provide awareness, prevention, support and ultimately a cure for paralysis. The foundation’s Wheelchair Donation Program donates approximately 35-50 wheelchairs every year to deserving individuals. In order to apply for the program, recipients and their families must demonstrate a medical and financial need for the new wheelchair. Unlike many other wheelchair donation programs and related charities, the Darrell Gwynn Foundation specializes in high-tech, customized wheelchairs. While standard manual wheelchairs are valued at approximately $350, the wheelchairs the Darrel Gwynn Foundation provides are valued anywhere from $6,000 to $40,000 depending on the medical needs of the recipient.